Several years ago our university held an International Dance Festival, and asked local families to host foreign dancers. My family volunteered, and we had two Koreans come to stay with us. While they were at our house they cooked a Korean meal for us, and this is what they served (it is also known as Bulgogi). It is delicious and has always been one of my favorites! 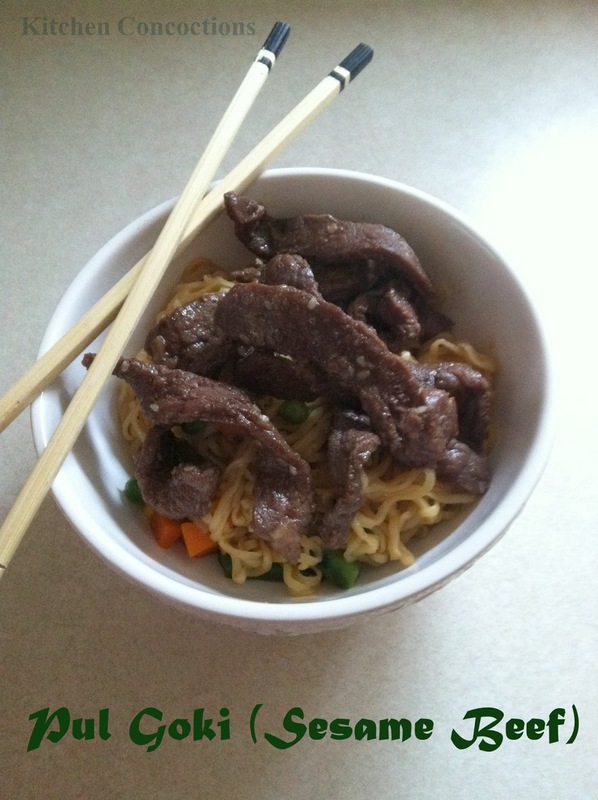 To make the marinade, combine all the ingredients, except the beef and noodles, in a bowl. Stir until the sugar is dissolved. Set aside. Slice the beef into very thin strips. Put the beef in the marinade mixture. Stir until coated. Cover and refrigerate for 1-2 hours. Once the meat has marinated, broil, grill or saute the beef strips until cooked. Cook the noodles according to the package directions. Serve the Pul Goki over the noodles.